Disclaimer: This review is coming unashamedly from the Harry Potter fandom. I’m one of those people. I have horcruxes hanging from my window and an elderwand on proud display on my shelf, among the many character figurines dotted all around my house. I’ll sit in my Hufflepuff hoodie and dominate a Harry Potter movie marathon any day of the week, and I’ll cry every single time in that scene with Dobby – you know the one. So, to fully disclose my own bias, inevitably my evaluation of The Fantastic Beasts movies hangs at least somewhat on how well they fit into the whole Harry Potter series. And for me, they’re struggling to do that. I can’t count the number of times I’ve watched the Harry Potter movies, yet I only saw Fantastic Beasts and Where to Find Them once when it first came out, and while I enjoyed it enough, I never really felt tempted to try it again. Fantastic Beasts: The Crimes of Grindelwald, directed again by David Yates (who also directed the first Fantastic Beasts), however, promised a bit more to catch my eye, namely some sweet revamped shots of Hogwarts and a hot Dumbledore. Well, yes, hot Dumbledore, let’s start there. Sure, Jude Law looked good in a little waistcoat – let’s not lie to ourselves. Did he channel what I imagined a young Dumbledore to be like? No, sorry Jude. The essence of Dumbledore is his wise, calm nature (excluding that unfortunate Goblet of Fire scene), and while younger Dumbledore I guess hypothetically might not have accrued his wise one-liners yet, the character seemed to lack the humility and thoughtful nature that is Dumbledore. He seemed cockier and more self-assured, and his accent wasn’t quite right. However, to be fair, the movie didn’t really give him a chance to develop as a character – his on-screen time and the depth of his scenes were both very limited. Johnny Depp had more of a clear shot in his return as Grindelwald. As there was barely a mention of his character in the Harry Potter movies, we had nothing to compare him to. His performance was well done – he definitely created a believable and despicable villain, carrying almost all of the scarce emotional depth of the film. 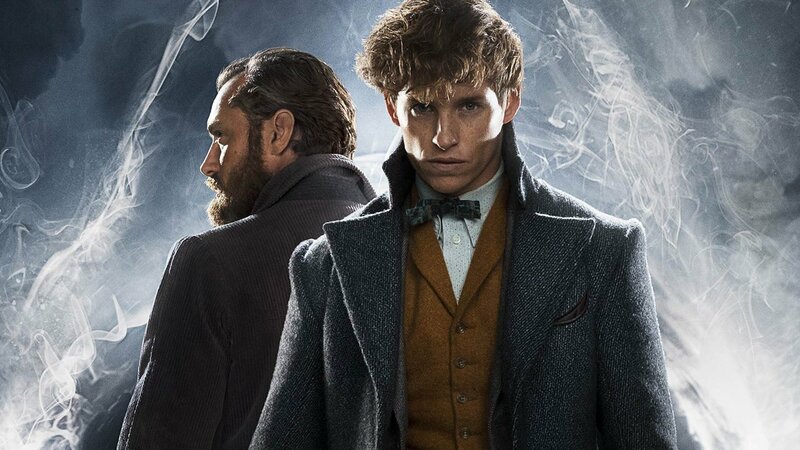 We also saw Eddie Redmayne back as Newt Scamander, our sweet, bumbling protagonist of the story who just wants to look after his magical creatures in peace, like an awkward Hagrid meets David Attenborough of the wizarding world. He really is quite likable and adorable as Newt. However, again, his character very much lacked depth or storylines which we as an audience could connect to. His relationship with ‘Tina’ (Katherine Waterston) is hinted at, but never really played out, and remained surface level, as do all the relationships in the film. The real break-out star of the film was Zoe Kravitz, as the captivating Leta Lastrange, who actually had some emotional backstory and inner anguish that connected well with the rest of the bigger storyline and she performed this convincingly. The rest of the characters were quite side-lined and relatively inconsequential. I did, however, very much enjoy the nods to the original Harry Potter series. I had feared Hogwarts scenes would be overdone, or recreated versions of scenes in the original movies, but the film did find a nice balance. The views over Hogwarts were beautiful and the class time and flashbacks were instrumental to the storyline. I particularly enjoyed the incorporation of Nicolas Flamel as a character and even a nerdy glimpse of the Philosopher’s Stone! So there certainly were a few scenes to keep the fandom excited and probably dragging our feet back to the next release in the series.